Reflecting the size of a competition category in the amount of points awarded. This new approach was initially proposed by Deb and Matt of Fevah Modern Jive, Christchurch. The most complex task was to come up with the actual points values in the tables above, this was handled by one of teachers and judges - Dave Kerby. In his non-dance life Dave works as an accountant for a $100m+ p.a. organisation specialising heavily in the area of forecasting models. Dave created a sophisticated data modelling and forecasting program to optimise the points values by simulating 10 years of competitions to see how the points distribution would evolve over time. The whole process took over 100 hours of development. As part of the testing, a simulation was run prior to the 2016 Christchurch Champs and compared against the actual results, the difference in expected points per competitor was less than 2. We are extremely fortunate to have Dave's combined knowledge of modelling, forecasting and dance competitions to arrive at a solution we believe will benefit all our competitors and anyone who wishes to use the Modern Jive Points Index. Deb is one of the co-directors of Fevah Modern Jive with 16 years of Modern Jive competition experience, 4 years Dancesport competition experience and 12 years experience of judging Modern Jive competitions both in New Zealand and Australia. Deb worked with Dave to ensure that the Points Index would help serve the needs of our dance community. Matt is the other co-director of Fevah Modern Jive with slightly less experience than Deb and does the backend database and web site development. Below is a copy of our announcement in 2016. Making Modern Jive Competitions – Even Better! Hi! We are Deb and Matt. You probably know we live in Christchurch. We run Fevah Modern Jive and host the Christchurch Championships. This year  we have a great opportunity to create a new competition system for the whole of the NZ modern jive community. One that includes everybody who competes in modern jive, no matter which brand. We love competitions. Our Christchurch dancers love competitions. And we know lots of other dancers in NZ do too. We want to make competitions as rewarding as possible for everyone. It is a lot of work to figure out how to do that, but we are committed to continuous improvement, so we are willing to give it a try – for YOU! The origin of the word competition comes from Latin. It meant "to strive together". At the core it is about coming together with others who have a similar goal and striving to achieve that. It is more about working together, supporting each other in a quest, than it is about trying to be the best in a group. directly from Late Latin competere "strive in common", in classical Latin "to come together, agree, to be qualified", later, "strive together" or "to strive (alongside another) for the attainment of something". From com- "together" + petere "to strive, seek"
We like that. And having spoken to many people about why they like doing modern jive competitions, it is just that. Coming together in a group from all around the country to do something we love while we all strive to be the best dancers we can be. We can therefore see that there is little reward in dancing in a category with just semi-finals or straight finals and placing in a small field. It means much more when we place in a large field where we have had to dance more, together with a larger group of competitors. In fact, it can be as much of an achievement, or more, to get through one round in a large group than to place in a small group. We want to do this dancing stuff with more "others". It is more challenging, which in turn is more rewarding, and then it is more fun. MORE DANCERS = MORE CHALLENGE = MORE REWARDING = MORE FUN! 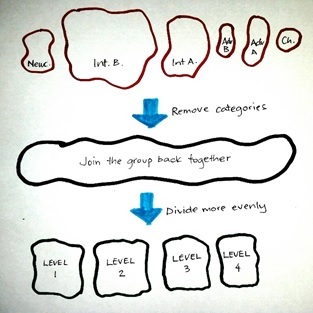 Let's change from 6 categories to 4 levels and put the dividers in different places to even out the field. Now, competitions are a different type of activity to classes, and require a different set of skills, so let's call them different names to what we all call our levels of classes. We have searched high and low and prefer to copy a generic term: Levels! Level 1 is the entry level and you climb through 2 and 3 to get to Level 4. We can also see this providing an opportunity for expansion should we grow enough to require a Level 5 etc. Progress through the levels should be about your competition experience and performance. Not how long you have been dancing or what classes you have attended. Therefore, dancers will start competing at Level 1 and will earn their way through the system with experience. Level 1 will be able to dance without being restricted to beginner moves. Let's give more people more rewards! So... That means the greater number of competitors in a category, the greater number of rounds there are to compete in and therefore there are more points to be won by competing against more people. The size of competitions will self-regulate the number of points to be won. Sounds fair, doesn't it? We think so. For competitions not using our new modern jive competition system we might not be able to track Progression Points but will happily accept applications from dancers to include points for their entry and placings. This way all your competition experience is relevant to you no matter where you go. Now, we want it all to still be fair and create a sensible system for competing and elevating so there needs to be a couple of rules to make it work. You will only add points to your personal total from your highest scoring category at each competition. Let's call this your highest scoring Points Path. When you earn enough points at a competition to progress to the next level your points will be adjusted back to the start of that level for your next competition. Most categories at a competition will be eligible for earning points. Categories may be allocated a lower scale of points depending on their classification. i.e. Standard freestyle and DWAS categories will attract a higher scale of points (tier 1) than the fun categories which may in turn also be given different scales (e.g. tier 2 and tier 3 etc.). Or a competition organiser may wish to allocate a category as not eligible for points if the format will not represent the 6 couples per heat model. For each category you enter you might get 3 types of points which will add together to be the Points Path Total for each category. You would only get 90 points (i.e. the highest total) added to your personal points score for this competition. Sounds fair right? We think so. So... put it all together and we think we have a new, improved way of structuring competitions to make them more fair and more fun. It seems like it is going to work. We have put a LOT of thought (and late nights) into it, but as always, we are open to feedback and may need to introduce a few tweaks or improvements along the way. But you never know if you don't try! This is clearly a more complicated system to track but we believe it is worth doing it right for you. That also means there is a lot of development going on to test it all and we have some amazing back-room peeps on the job. We hope you know you can trust us to try to create the best possible outcome for you. Let's try it out at Chch Champs this year and then we'd love to get your feedback to help refine the system. We believe this is going to be a good thing for modern jive competitions in NZ and you never know... if it is a good thing, others may join us too!